I’ve always loved the idea of doing a triathlon but have been put-off by the concept of sustained physical exertion. Luckily there’s an automotive version that can be completed from the comfort of an air-conditioned car – and because it ends in Italy, a mountain of pizza and Peroni awaits at the finish line, rather than some fruit and leg-ache. 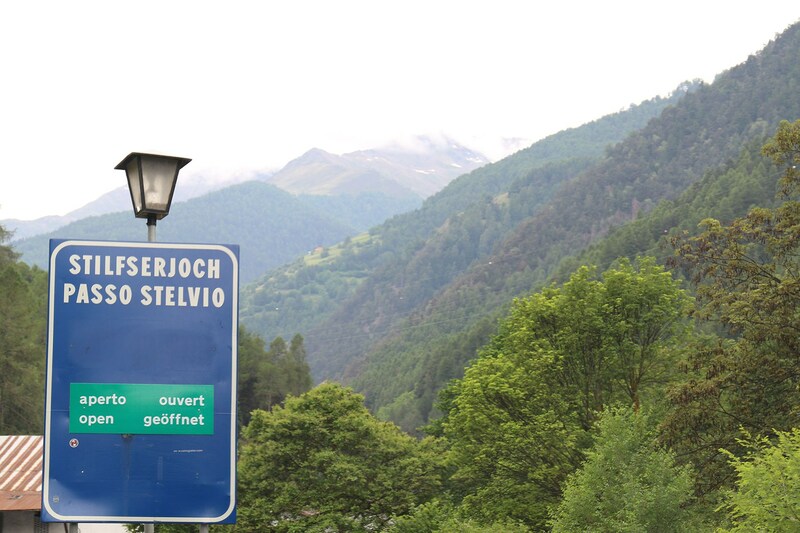 The route is simple – put ‘Bormio’ in the sat-nav and when you get to Calais turn left towards Cologne rather than the Mont Blanc tunnel. That way you get fast autobahns, twisty Alpine passes and narrow urban streets in an all-inclusive triple test of a car’s ability – with top speed, handling, and agility all stretched to the maximum. A 2000 mile adventure through Europe requires an equally epic car, of course. It needs to be comfortable, fast, fun to drive, ideally Italian, and in our case, spacious enough for three plus luggage. Given that brief there’s really only one choice – the Alfa Romeo Giulia Quadrifoglio. Is there a serious point to all of this? Absolutely. This is a test of endurance and reliability as much as anything else. 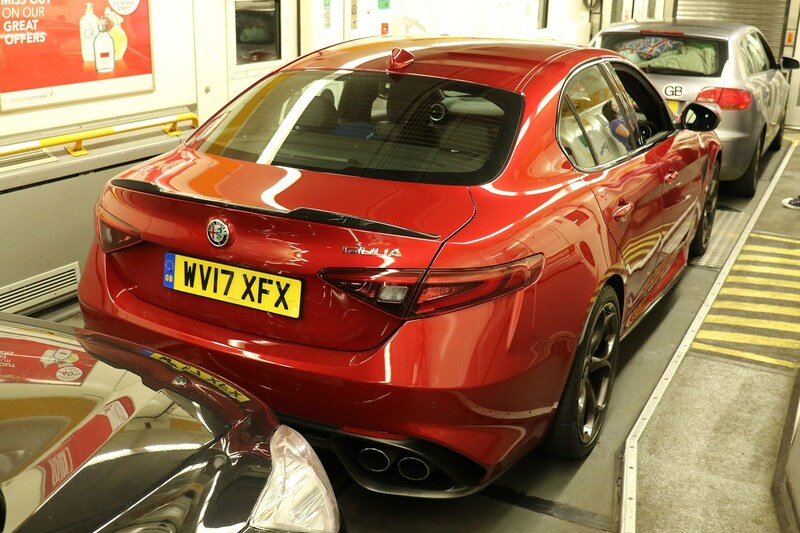 We’ve enjoyed our brief jaunts in this Alfa – including hot laps at Balocco and drives on UK roads – but to really get to know a car you need to do big miles in it. There’s also the spectre of Alfa Romeo’s slightly, err, unflattering historical reputation for reliability. And that’s a question mark potential BMW M3 converts will want clearing up. 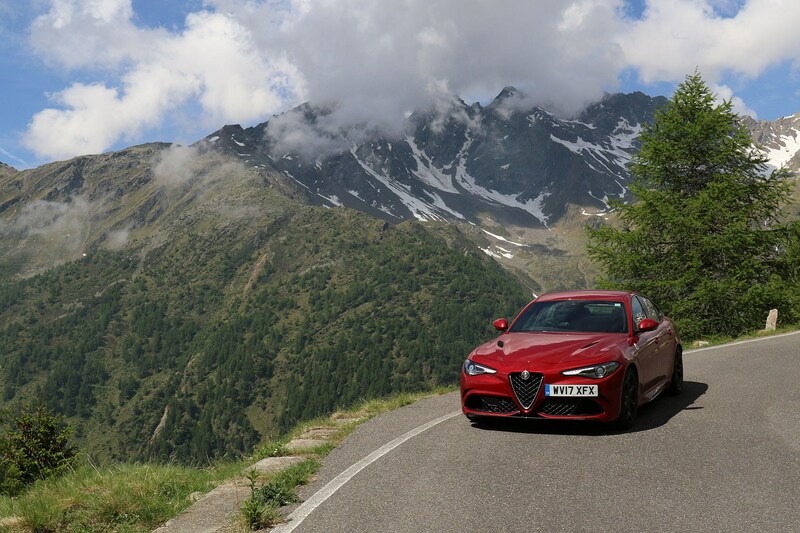 So we’re going to drive the Giulia home, right through the Bavarian heartland of its biggest competitors, and across the Stelvio Pass which, incidentally, Alfa Romeo has chosen as the name of its first SUV. Our luggage for this trip takes up roughly half the living room floor. I’ve been saying for days that there’s no way it will go in the car, but remarkably it does, and without any of it sloshing around on the rear seats either. The boot’s 480-litre capacity means the Giulia is on par with German rivals. It narrows at the back so it’s not exactly square, and I guess that would be annoying if you wanted to pack it out with crates of French wine. But we’re not going through France, so it only needs to hold squashy overnight bags, and therefore it’s fine. In the cabin you get a decent-sized storage box with a power socket under the armrest but the door pockets are small and there’s only space for one drink in the centre console. Then again, that’s why passengers have hands. Weirdly the seatbelts are not height-adjustable, but the rest of the driving position is perfect – you can set the comfortable seats super-low for the full tarmac-skimming experience, and the wheel can be set touring-car-close to your face. The Giulia’s starter button is mounted on the wheel and the car starts with a small flourish that settles down to a menacing burble, with hardly any of the extravagance rival sports saloons boast. At first that’s disappointing, but over time I reckon you’d get bored of your car bearing its chest and bellowing witness me! at 6am when you just want to get to work. Pressing every button and rattling every switch yields some clichéd results – the drive mode selector feel cheap, while the gearshift paddles are weighty with a satisfying click. The steering, even in the first few slow corners out of the estate, feels full of promise. Aside from a spirited blast up a slip road the trip to the channel crossing is a dull motorway slog. What is surprising, other than how alarmingly fast the Giulia feels, is just how comfortable it is bumbling around at 70mph. The suspension is genuinely supple – which is lucky really, given that we’ve got more than 2000 miles ahead of us. We’ve got to get a good way into Germany on day one because there’s a long haul to the Austrian border to tackle on day two, in order to set up a whole day in the Alps on day three. Get the first leg wrong and the whole thing will come down like a house of cards. 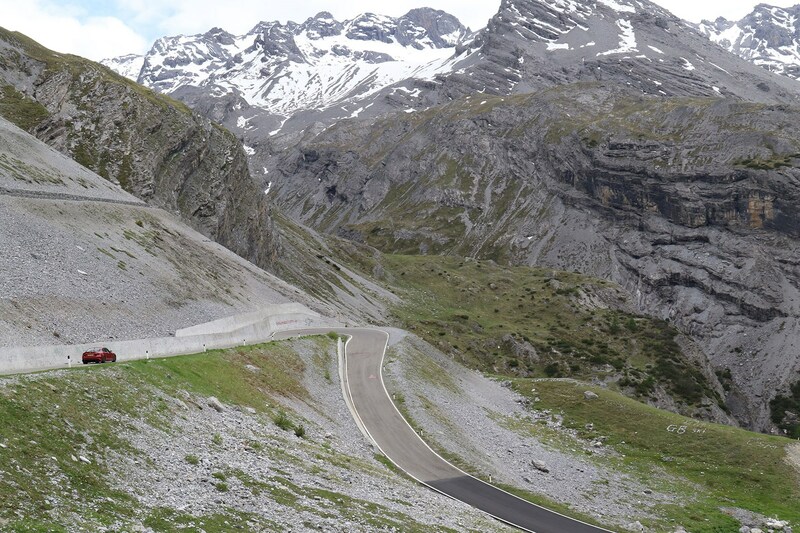 Or, more poignantly, I won’t have a full day on the Stelvio Pass – a disaster. Getting into the Eurotunnel train in a wide car with fancy telephone-dial alloy wheels and rubber-band tyres is a stressful as ever, and a queue of frustrated motorists forms behind as we tip-toe between the two-inch high metal kerbs that flank the carriages, which look sharp enough to grate parmesan on. The Alfa notches up another admirer and even in the artificial light it’s easy to see why. This is an arrestingly beautiful car – frowny and hawkish at the front end yet squat and purposeful at the back, largely thanks to the quad-pipes and matte black diffuser. However, I still prefer the 159’s face – and if you’re honest, so do you. Day one isn’t the biggest in terms of mileage but does see the most border crossings. Including the UK we will go through five countries - France, Belgium, the Netherlands and Germany. 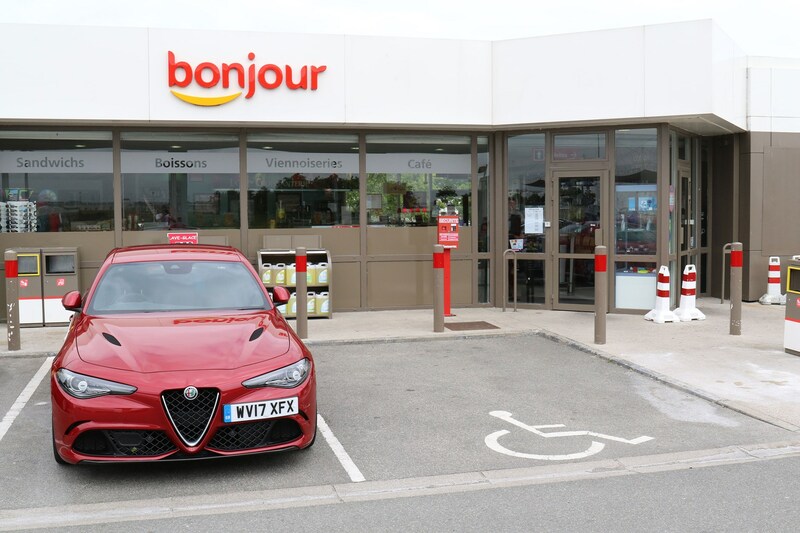 After a respite stop (and to stock up on Palmito biscuits) France evaporates away with surprising ease, but as we enter Belgium the Giulia’s sat-nav develops an odd habit of diverting us off the motorway. We end up driving through Bruges first, which is beautiful but annoyingly time consuming. The Belgian pave presents a good opportunity to test out the suspension, but before long we’re sat in a lengthy traffic jam in central Antwerp. With our ETA pushing further and further into hotel-restaurant-shut-o’clock my co-pilot dives into the sat-nav and discovers the route is set to shortest, rather than fastest route. Oops. In all honesty though, even when it’s set up properly, the Giulia’s sat-nav isn’t the best in class. It’s nicely integrated into the dash but the display isn’t the clearest to decipher (especially with polarising sunglasses on) plus it’s wide and narrow like a letterbox, giving you a good view of what’s left and right of you, but not in front. Back onto the motorway we get back to ticking off the miles and before long the border with Germany beckons. As we join the autobahn an Audi A7 Sportback pulls out from behind and passes me at escape velocity and I suspect he’s been waiting a good few miles to do so. Something about this car makes German motorists very competitive. By the time we get to our hotel just outside Cologne it’s too late to go out for any trademark tiny glasses of Kolsch beer. Still, an early night is probably more compatible with our itinerary. If this trip was the Tour de France then day one would be a transitional stage, and day two a big, flat haul on the way to the mountains with several bunch-sprints in between. The entire German autobahn network is laid out before us and we’re in a 503bhp, four-door saloon that can theoretically crack 191mph if the driver is committed enough. In the Giulia blasting along on a quiet, dry motorway feels largely the same as driving at normal speed after a while, except everything is a bit blurrier. That’s testament to its immense stability, that it feels so normal at high speed. The real exhilaration comes when a restriction suddenly clears, at which point the Giulia’s turn of acceleration is extremely impressive. 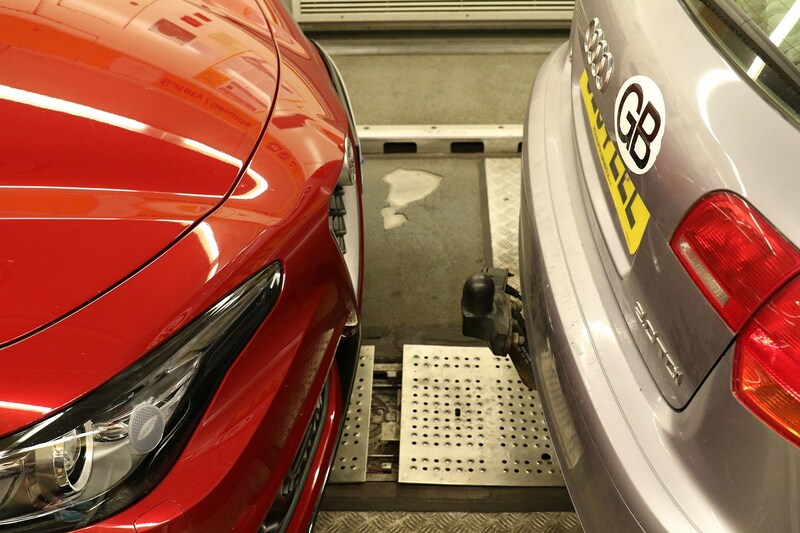 There aren’t many chances to test the 3.9 second 0-62mph time on the road but when you want the car to accelerate faster than everything else around you, it does so with eye-widening ability. That’s partly because it’s light – the Quadrifoglio features plenty of carbonfibre bits, not least the propshaft and bonnet. You can actually see the weave on the underside of the bonnet; I can’t decide if it looks sporty or unfinished. Alfa’s 2.9-litre V6 packs two turbos and a substantial 443lb ft of torque which fills the midrange with plenty of overtaking punch. Best of all the engine keeps pulling right up to the indicated 7000rpm redline – accompanied by a raspy bellow from the exhaust. It feels boosty when the turbos are spinning but with an oddly naturally aspirated rush to the redline. In theory the north-to-south schlep through Germany should be achievable on a single tank of petrol, given the car’s 58-litre fuel capacity and promised 34mpg. However, that would require a delicate right foot rather than my horse-shoe clod hoof. We’ve been getting 24mpg – which is actually pretty decent when you think about it – but means a midway fuel stop is required. That means I’ve got to stop and park the Giulia in Germany which inevitably means a German will ask me why I didn’t buy a BMW M3. So far this has happened twice and we’ve only been in the country one day. Secretly I think what they’re really asking is whether BMW needs to be worried by the Giulia, and given how many of them we’ve comprehensively dropped on the autobahn, I’d say it probably does. Shortly before Kempten we pull off the motorway for late lunch at a place that describes itself as the ‘XXL schnitzel paradise.’ It certainly delivers. We arrive in Kempten lethargic and suffering for catastrophic indigestion only to be told the hotel’s restaurant specialises in schnitzel and we absolutely must try it. Burp. 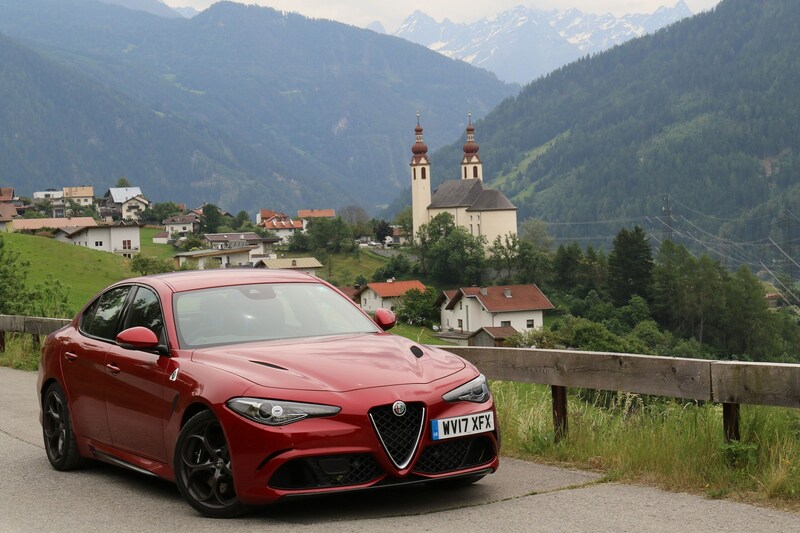 Staying near the Austrian border gives us the perfect springboard for the Alps on day three – with a short hop to dispatch before testing the Giulia’s prowess on the Stelvio Pass. As we prepare to wave goodbye to the autobahn and top speed part of our triathlon I squeeze the accelerator pedal for a final blast of restriction-free driving. 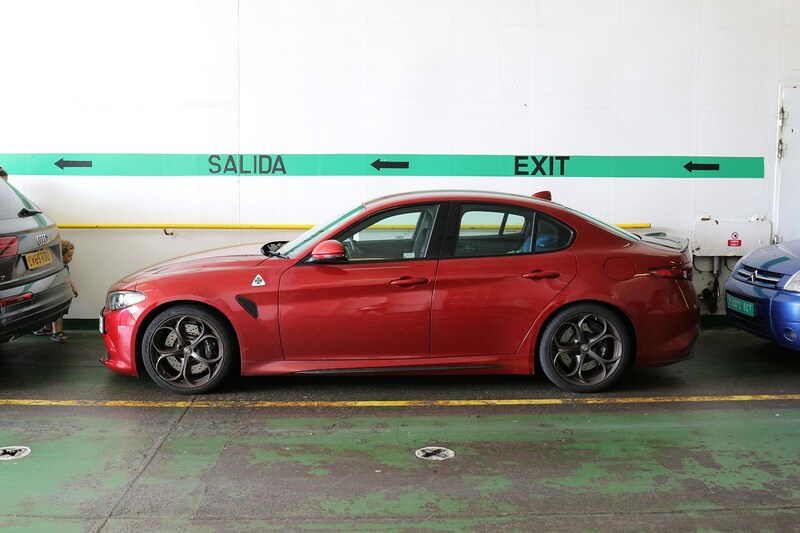 The Giulia feels like it’ll just keep pulling and pulling until you run out of road or fuel. Driving this car on a UK motorway is like having a pet peregrine falcon but only letting it fly around your conservatory. Driving into Austria means picking up a vignette – a pre-paid motorway toll – which is affixed to the driver’s side of the windscreen. It also seemingly tells the sat-nav to avoid roads of any real interest, which takes us down boring, trafficky dual carriageways and tunnels. 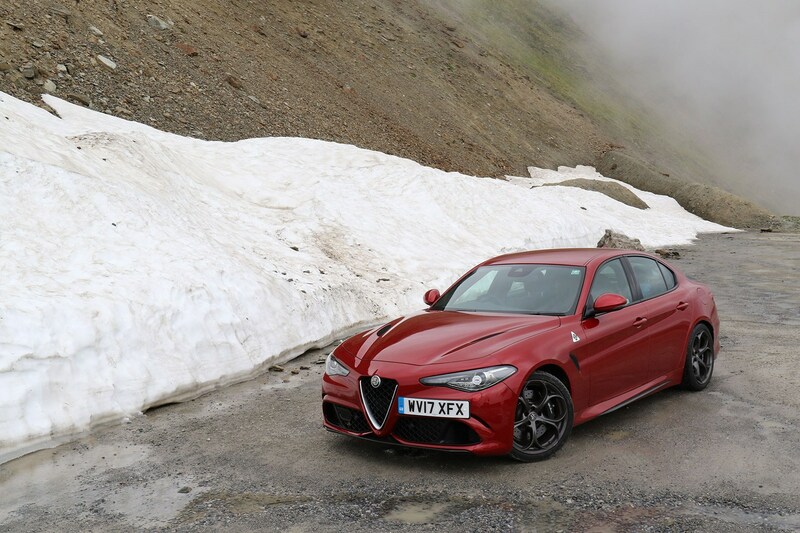 Curiously the Giulia’s nav overlays the snaking hairpin mountain routes on top of our route so we can watch what we could be driving on melt away. Once again we ignore it and go exploring, discovering stacks of stunning Austrian scenery in the process. We stop just over the Italian border for lunch and the force of admiration for the Giulia increases. People walking past do a funny double-take, looking first at the car and then at the offset UK numberplate. We’ve experienced a lot of love for this car and I reckon it’ll only get more intense as we get closer to Milan. It won’t have escaped your notice that Alfa Romeo has chosen to name its new SUV after this famous road in northern Italy. 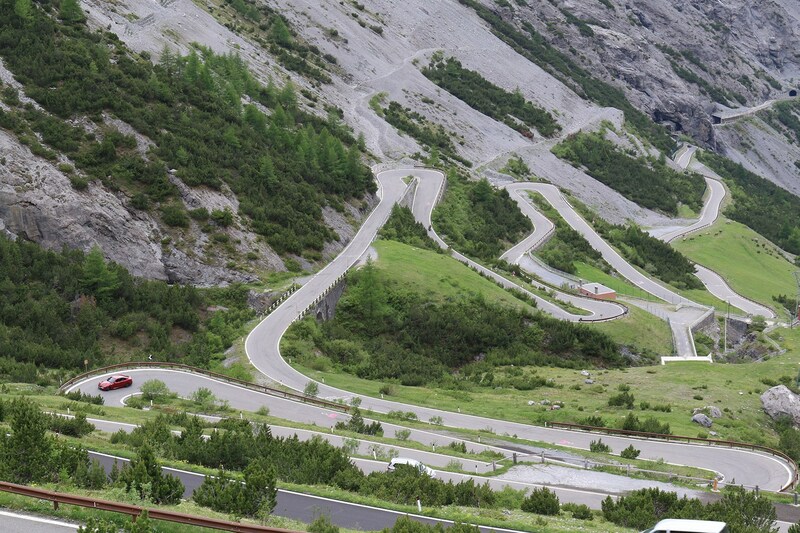 With 60 switchbacks it’s a proper challenge for a car and if you approach it from Austria, as we have, 48 of those greet you all at once, lined up on the face of the mountain in a wall of hairpins. It’s also tantalisingly close to Alfa’s spiritual home of Milan and the scene of many great cycling battles in the Giro d’Italia. That means it’s often busy with all sorts of traffic, but if you come midweek and are very lucky, you might get a relatively clear run. Miraculously for our ascent we had the road to ourselves, save for about three cars coming down the other way. This side of the pass is extremely narrow, especially around the hairpins, so it’s best to restrain yourself unless you can see a long way down the road. On numerous occasions later in the day we’d tiptoe around a blind bend to find a vehicle well over our side of the road. Eeek. The Giulia has four drive modes selected via a rotary dial labelled DNA - the bottom setting is a quiet and slushy eco programme, while the top dynamic setting sharpens up the throttle, gearshifts and suspension. In the middle there’s a neither-here-nor-there-mode. Finally there’s a self-explanatory Race mode, accessed by holding the toggle all the way round. Dynamic is fine for most applications but the Giulia’s soundtrack is still a bit muted until 3000rpm or so before a flap in the exhaust opens and it barks into life. Race mode gives you maximum noise but weirdly also knocks out the digital speedometer so that it can recommend quite fiercely that you use the manual paddles (which you would be anyway, surely) but the really strange thing is it feels smoother in this setting than in Dynamic, which punctuates every gearchange with a kick in the spine. It also relaxes the traction control (there is no separate switch for this) which unshackles the Giulia’s rear end and makes it feel much freer when accelerating out of a turn. You’re not completely on your own though, as there’s a torque vectoring system to help keep you pointing in the right direction. 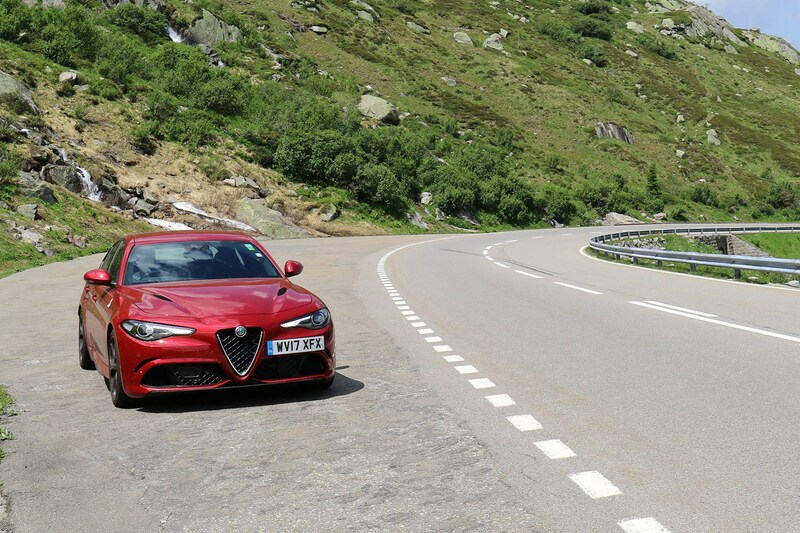 Double wishbone front suspension and multilink rear, managed by ZF Sachs dampers, mean that the Giulia keeps as much tyre on the road as possible, and it’s dream-made-real stuff to thread the car between the solid wall of the Stelvio on one side and an unchecked plummet the other. The road opens out as the summit comes into sight and even in the height of summer there’s a good deal of perma-snow clinging to the mountaintop. We stop for a short break to rest the car (and driver) and while peering over the edge of the cliff two bikers say they heard the Alfa coming from miles away. This is quite satisfying. The south side is much wider and better sighted, plus the weather has improved, so we make multiple trips up and down until it’s quite clear that the fuel tank is getting, how do you say, a bit fumey. It’s a hard thing to pull myself away from – the Giulia feels like it was made for this road, with blistering speed and a wonderfully balanced chassis. All the controls are so satisfying to use, from the huge and elegantly curved gearshift paddles to the mechanical feel of the steering. The southern side of the Stevio is less steep and not as intimidating, and therefore a bit less of an adventure, but its shallower turns are much more fun in the Giulia. Over on the other side, the apex of each corner gains a good foot or two in height so you have to go wide unless you want to tear off one of the Alfa’s side skirts. 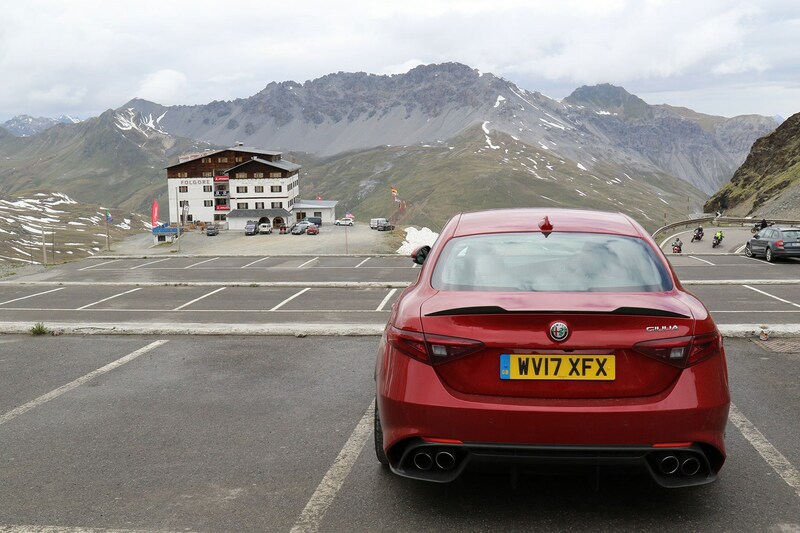 Motoring journalism is full of superlatives these days so you will be forgiven for taking this statement with a pinch of salt – driving the Giulia on either side of the Stelvio was one of my best ever experiences behind the wheel, and is likely to remain so. At the bottom after a slightly panicky search for 98RON and a pizza we fill up the Giulia and its passengers and bed down for the night. Our hotel is an out-of-season ski lodge and is therefore empty, which is good news for breakfast. Day three was mentally and physically quite tiring, and there’s another mountain road to cross today, in the form of the Gavia Pass. 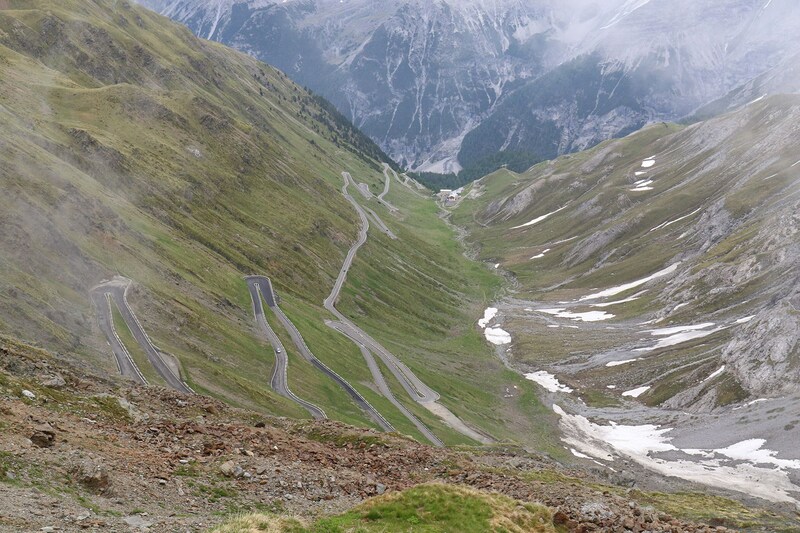 Another Giro route, the Gavia is less travelled but certainly more hairy than the Stelvio. It might not be as busy but it’s mostly single-width carriageway with blind, guardrail-free corners, where a tourist in a fast Alfa could come very unstuck indeed. We decide to trundle up and down it and take in the wonderful views. A German group in a fleet of GTVs, plus a 159, pulls out of a layby as we pass and follows us to the summit, where they demand to know why I’ve brought the automatic Giulia Quadrifoglio and not the manual. This becomes the Italian equivalent of the German ‘why didn’t you buy an M3?’ question. 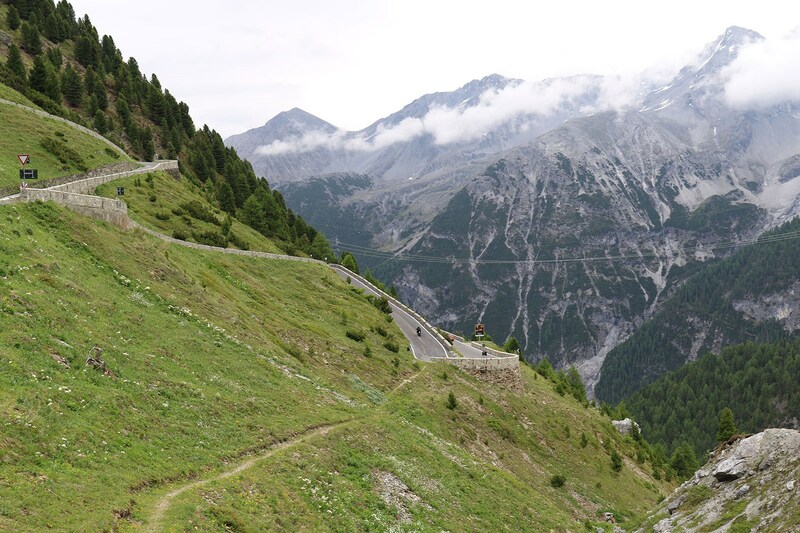 Descending the Gavia gives way to wider roads and towns and before long we’re on a dual carriageway again with the thought of those wonderful mountain passes and the strain they put on the Giulia’s handling a fading memory. Still, the remarkable breadth of ride settings from comfortable to super firm is even more impressive now having sampled the latter in the mountains, before switching back to comfort mode on the motorway. The hard seats (which initially worried me) have actually proved to be ideal – because they’re not squashy you sit up straight and get less back ache as a result, plus they grip you hard when cornering. You do have to prod the seat heater control three times to get the maximum lumbar-soothing temperature though, which is a bit annoying. The next stop is Lake Garda before we head off to Milan and the Alfa Romeo museum to soak up some heritage. No trip to Italy in an Alfa Romeo would be complete without a stop at these two spiritual homes – Milan and the nearby Museo Storico. 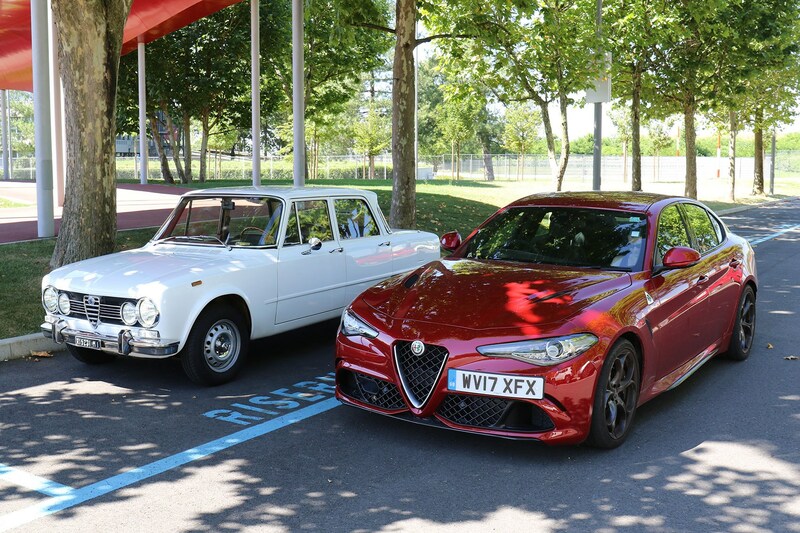 We tick off the former first, keen to get a sense of how this newest Alfa Romeo fits into a modern Italian city. This one is a maze of narrow cobbled roads with regular width restrictions in the form of roadworks jutting out from the pavement, with pedestrians and cyclists simultaneously weaving around you. Milanese drivers also don’t take any prisoners – to get through here in one piece you need to be quick-witted and willing to commit when a gap opens up ahead. In short, it’s really not an ideal place to drive a wide, cantankerous supercar which is better suited to driving on the autostrada or being parked up next to a boat in Monaco. Oddly the Giulia is surprisingly easy to thread through these streets, especially in slushy eco mode which seems to deploy the V6’s power in a smooth and linear fashion. It also rides really well, soaking up the lumpy tarmac’s bumps without transmitting a shock or noise into the cabin. One of the biggest surprises on this trip is not how capable the Giulia is on a mountain pass or high speed run, but at the other stuff you don’t expect from a sports car. Pottering around town or sitting in traffic, for example. We've only got one complaint here and it’s the brakes – they seem to bind up unexpectedly when slowing down, particularly when you’re trying to crawl at low speed, bringing the car to a complete stop. After a bit of time you learn to modulate them differently but it’s a jarring disconnect between car and driver considering its otherwise telepathic nature. Driving to the Museo Storico (a must for all fans of the marque) on a Saturday afternoon is like taking part in a slowly growing Alfa Romeo procession. It seems like every AR club in northern Italy is meeting there, and true to form on returning to the car park we find an invitation to the Lombardia branch wedged into the door. The old Arese plant has been modernised with a bright red tunnel that has been grafted onto the existing structure. It houses, without doubt, some of the most beautiful and exciting cars ever made, including (but not limited to) a twin-engined GP Bimotore, Giulia TZ2 and 33 Stradale. For me there were two highlights – the 8C and DTM-prepped 155. Opposite ends of the scale in terms of styling and purpose but both brimming with some of that innate Alfa magic you can now experience for yourself in the Giulia Quadrifoglio. This was an extremely testing trip for any car, involving a hugely demanding high-speed run, chassis-twisting mountain attack and bumper-threatening inner-city crawl, interspersed with boring everyday driving. I was anticipating the Alfa to impress on the autobahn and the Alps, but its talents everywhere else were a complete surprise. Ok, it’s not perfect – the interior isn’t quite up to BMW or Audi standards – the wheel is an odd collection of leather, alcantara and carbonfibre surfaces, for example. There are some funny quirks too, like the fact you can feel the movement of the wiper blades through the brake pedal and how far you have to reach around the gearshift paddle to get the indicators. Putting that aside though I can’t tell you how satisfying it is to drive an Alfa Romeo which feels exactly how you would imagine it to from seeing pictures of it in a magazine or advert, or to get out of one 2000 miles later without having suffered a single problem. An absolutely fantastic Alfa, but more importantly, a fantastic car.